Once the Dual-Language Transcription Module has been activated follow the steps below to upload content for this service. If this add-on module has not be activated please contact your 3Play Media account manager or 3Play Media Support to enable this feature. After configuring your transcription settings click Upload Media on the upper, left-hand side of the My Files page. Click the tab for the upload method that you would like to use. 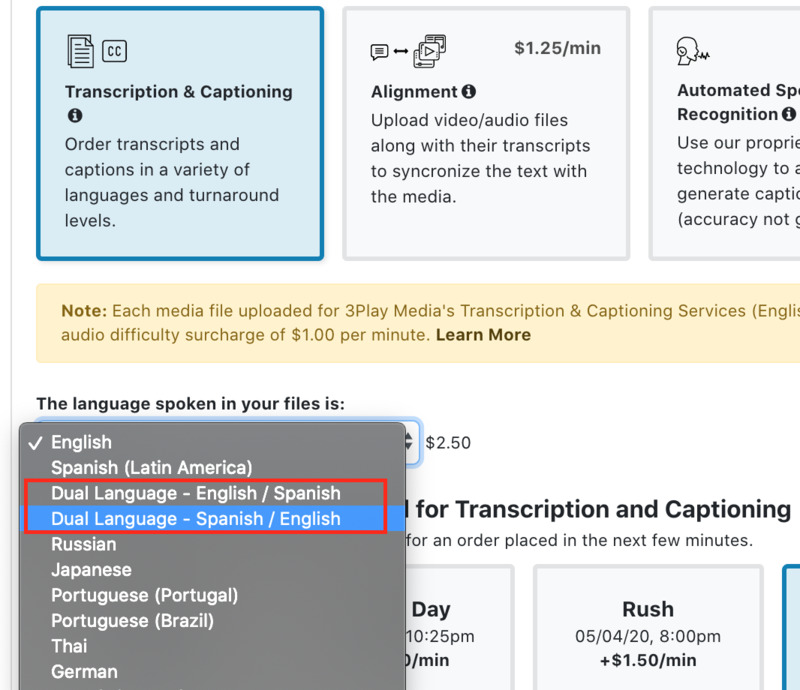 *requesting dual-language transcription is only available for the integrations where the media files hosted on 3rd party platforms are viewable from within the 3Play Media account system. Select the media files that contain both English and Spanish for upload. Note that the process of selecting media files will vary depending on the upload method being used. 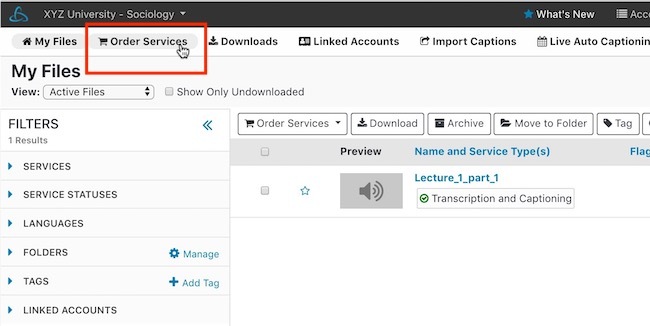 For more information on selecting media files when uploading from a Linked Account navigate to this section of the Help Center and locate the section specific to the video platform. After you have selected the media you will be directed to the Upload Options menu. From the Service tab, select either Dual Spanish/English - primary: English if the Dual-Language content is primarily in English or Dual Spanish/English - primary: Spanish if it's primarily in Spanish. Please note that the language selected in this step will inform the XML format language label, i.e., this will determine the language option displayed for the video player's closed caption button. Once a language is selected you are given the option to request additional services for the order like Vertical Caption Placement and Audio Description. Please note that the Audio Description service's output will be in English! Choose either the Standard four business day turnaround service level or the Extended 10 business day turnaround service level. Select an existing folder to upload your content to or create a new folder for this upload. Once you have reviewed your order and checked the box acknowledging the cancelation policy, click Place Order. Once Place Order is clicked your files will begin processing and will start in the Pending state. When the file is pending a glossary, cheat sheet, or PDF can be attached to give the transcription editors more information regarding your Dual-Language content.